First of all the tile saw cuts the granite into slab strips 10 mm thick (3/8") the full length of the granite block. 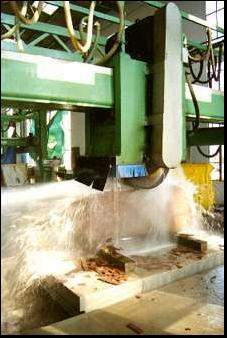 Since the tiles are to be cut into smaller pieces it is not necessary to use large granite blocks therefore cheaper, and more economical, smaller granite blocks may be used for producing tiles. Using these smaller blocks in our own production is very important to us since it means that we can add greater value to the stone since we always have a big export demand for our large blocks especially to China. 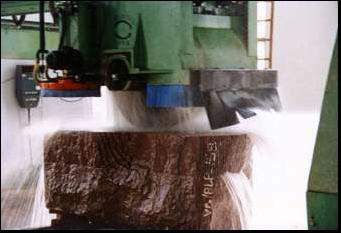 As you can see from the image on the right, the tile saw is a very powerful machine and slicing through the granite's very hard structure is relatively easy for it since the saw tips are composed of industrial diamonds. The length of the strip is determined by the length of the block being cut. Later in the cutting process, on the next page, the length is dimensioned to customer specification however it is very common these days for us to supply freelength strips for project work and the intsallers cut the strips to their required lengths on site. Copious amounts of water are used during the cutting process to ensure that the diamond tipped blades are kept cool. 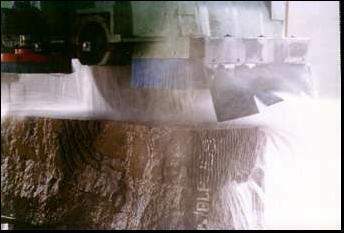 Even the diamond tips can be damaged during the cutting process if care is not taken due to the extreme amount of heat that accumulates whilst cutting takes place.